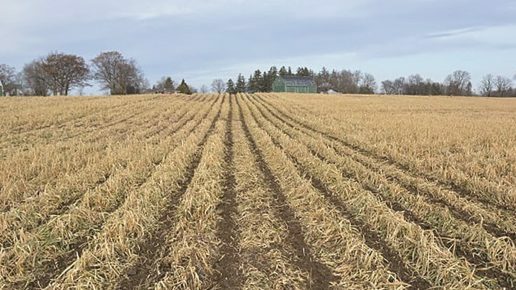 When it comes to seedbed preparation, “corn is very finicky,” says Ben Rosser, corn specialist with Ontario Ministry of Agriculture, Food and Rural Affairs (OMAFRA). Ontario farmers find that minimizing tillage, which can leave cold, wet soil at planting, often results in lower corn yields. But, by using a newer technique, strip tillage, farmers can reduce tillage without compromising yield. Strip tillage involves working a narrow eight- to 10-inch strip where the corn row will be planted. So in typical 30-inch corn row spacing, one-third or less of the soil surface is disturbed under strip tillage — a happy medium between no till and conventional tillage. “Growers can plant into a blackened strip while most of the field remains undisturbed,” says Rosser, adding that the tilled strip reduces the problem of seeding into the residue from the previous crop, reduces soil-borne disease and insect problems, warms up faster in the spring, and dries faster under wet conditions. At the same time, you reap the environmental, conservation and soil quality benefits of zero tillage on the majority of the field. Over the past two decades, there have been lots of studies and trials comparing tillage systems, particularly in the U.S. Midwest. Researchers at the University of Wisconsin have been comparing continuous and rotational corn yields under strip till, no till and conventional till since 2001. Jodi DeJong-Hughes with the University of Minnesota, and Aaron Daigh from North Dakota State University, have also collaborated on multi-year studies of strip tilling and published a paper titled Reducing Tillage Intensity in 2017. This paper looks at the actual benefits of strip tillage including improved seedbed preparation, soil structure, soil erosion, soil organic matter and economics. Their work highlights the advantages of strip tillage by warming and drying soil in the spring. They compared spring soil temperatures under four different tillage systems in Minnesota and North Dakota. They found average temperatures in the seed row at two inches deep were 5. 5 C (42 F) for no till, 8. 3 C (47 F) for vertical till, 10 C (50 F) for chisel plow, and 10. 5 C (51 F) for strip till. They point out the higher temperatures under strip tillage promotes faster emergence and crop development. Soil moisture is similarly affected by tillage method. In the same study fields, soil moisture ranged from 32 per cent of capacity under no till, to 25 per cent under vertical till and 19 per cent under chisel plow. In the strip-tilled band, moisture was 18 per cent of capacity and 29 per cent between the tilled strips. This means under strip tillage, a grower has the dry soil needed for a good seedbed as well as the moisture reserves provided by the untilled area. Ken Nixon of Ilderton, ON, grows corn, soybean and winter wheat in a three-year rotation on silt loam soil. He is a dedicated zero tiller; recognizing the benefits zero tillage provides in preserving organic matter and improving the soil. However, more than a decade ago, he switched to fall strip tillage in fields going into corn. “We strive for 100-plus bushel winter wheat crops and no-till corn does not work well, given our heavy residue from the previous wheat crop and our wet, maritime climate,” says Nixon.”We can get 40 inches of precipitation a year so we need to get the soil dried up and warmed up.” With that much moisture, pests such as slugs and millipedes often thrive in heavy winter wheat residue and strip tillage helps keep them under control. In an average year, Nixon found no significant yield advantage under strip tillage. But, in extremely dry years, when saving moisture through reduced tillage is critical for crop success, his strip-tilled corn fields out-yielded conventionally tilled fields by 20 to 30 bushels per acre. “One drawback is that with high interrow residue, there’s a greater susceptibility to frost damage in the spring,” he says. Still, Nixon insists the corn yield achieved through strip tillage is more consistent under various growing conditions than the yield achieved under conventional tillage. Strip tillage provides other benefits as well. It allows Nixon to spread his workload out so instead of rushing to complete field preparation in the spring, he prepares his field for seeding in the early fall, right after the winter wheat comes off and before his soybean harvest begins. So when other farmers are pulling out their tillage tools in the spring, Nixon is already pulling out his planter. Strip tillage also allows Nixon to apply much of his fertilizer in the fall. In fact, Nixon uses his strip tiller to apply half of three years’ requirement of phosphorous and potassium, mixing the product into the top few inches of the worked zone, thereby reducing the risk of phosphorus runoff into the environment. Fall fertilization also reduces the spring workload and he receives better service from his fertilizer supplier when applying outside the busy spring season. Most importantly, Nixon says strip tilling helps preserve organic matter, the holy grail of soil health. The coulter strip till machine Nixon uses actually divides the crop residue and moves it sideways onto the untilled strip where it decays naturally, rather than burying it by plowing or disking. The loosened, fluffed and blackened strip reflects not a loss of residue, but rather a planting zone cleared of residue that’s ideal for seeding corn. Nixon points out that strip tilling is a completely unique tillage system so anyone considering strip tilling needs to assess their entire cropping system including soil type, topography, typical moisture, field traffic and compaction, stubble height, amount of residue, equipment type and availability, guidance systems, weed control, and fertility practices. You need to design a system that will work for you and your farm. Jason Robinson grows corn, beans, and sweet corn on light, sandy soil near Courtland, ON, so erosion and drought are always a concern. To reduce these risks, Robinson switched to spring strip tillage eight years ago. He decided on a shank type tillage implement due to the sandy soil. He wanted a tiller that was easily adjustable for varying conditions and that would work in both corn and soybean residue. Robinson notes a number of advantages of strip tillage. He gets 18 to 22 more bushels per acre of corn compared to notill. It’s also greatly reduced his workload. Where conventional tillage required multiple passes to prepare the seedbed, fertilize and plant, he now needs but a single pass with the strip tiller to both prepare the seedbed and apply all the fertilizer needed for the crop. Robinson cautions that care must be taken to ensure the amount of fertilizer is mixed across the entire strip and that salt/ chloride levels are not too high. For him, RTK guidance is absolutely necessary to make sure the strips are straight. This tech can be advantageous on the planter too, although planters tend to follow the strip nicely on their own. For Robinson, the big advantage of strip tillage is early seeding. Instead of having to wait for a few days after conventional tillage for wet soil to dry out, Robinson says he can often plant the day after strip tilling. In dry springs, he has even planted on the same day the strip tilling was done. He says he’s tried strip tillage before on soybeans but finds 30-inch spacing to be too wide for that crop. Knowing the advantages, though, he’s considering twin row seeding, using seven-inch spacing, into the 10-inch strip-tilled band — meaning two rows of soybeans within each 10-inch wide strip. For that, RTK guidance on the planter will be very important.